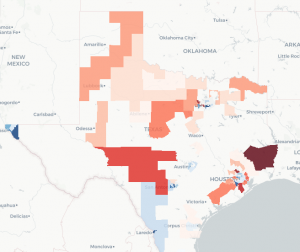 This month, we’re looking at three Super Tuesday primary maps of voter turnout and one fascinating map charting the racial change of Houston’s neighborhoods since 1970. The Texas primaries took place on March 1, causing long lines that once again highlight the antiquated technology and processes that Harris County uses. 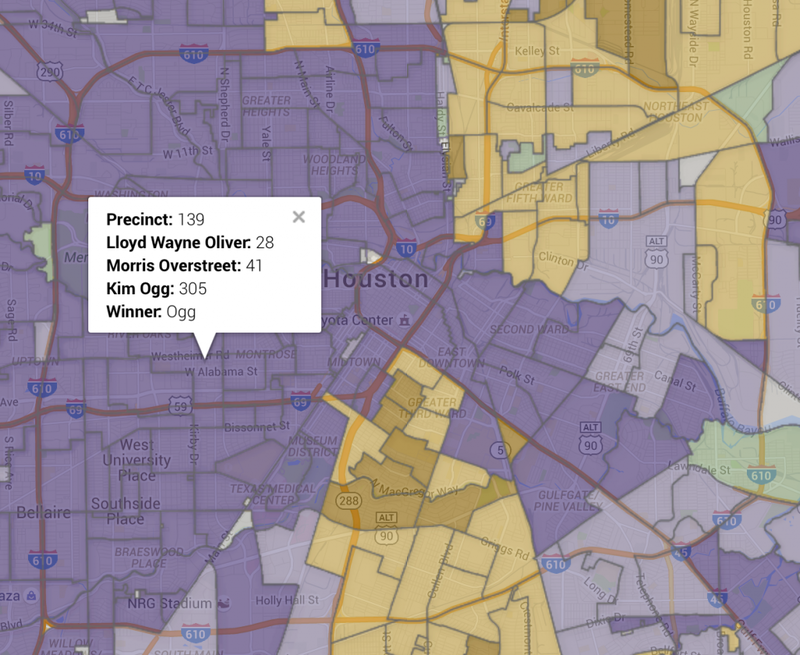 Case in point: the Harris County clerk still publishes election data in PDFs. 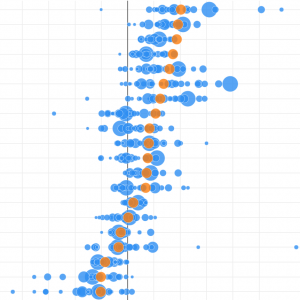 You can review raw data for the Republican and Democratic primaries on their site. Luckily, we have citizens who want to visualize this data, and they are willing to put up with a few institutional barriers along the way. Kris Banks put together these maps of the Presidential primaries, as well as a few meaningful down ballot contests. In this map, blue indicates a Rubio win, red indicates a Cruz win, and gold indicates a Trump win (of course, even the election map is gilded). Fewer surprises here, with the precincts surrounding Rice and UH going to Sanders, and the rest going to Clinton in varying degrees. 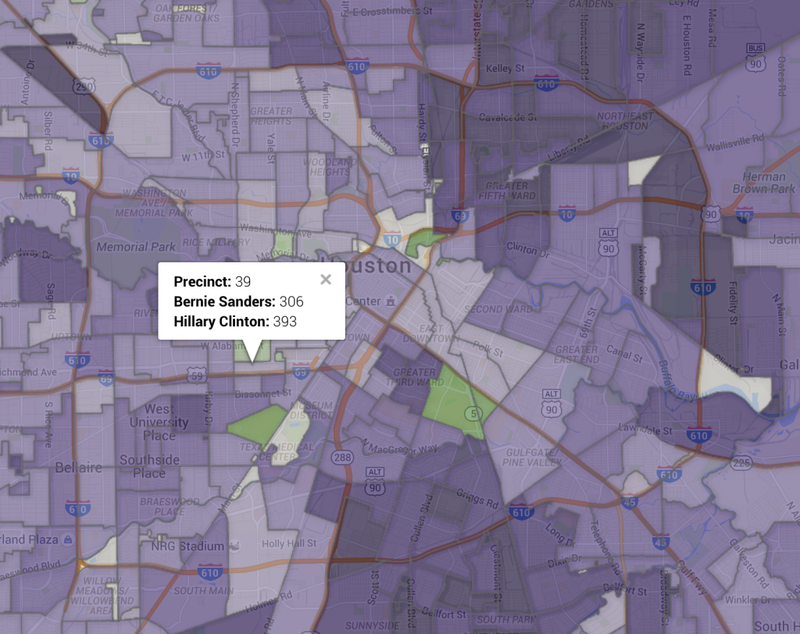 With several campaign appearances in Houston just before Super Tuesday, Clinton’s Harris County ground game was very strong. The Democratic primary for District Attorney led to a significant win for Kim Ogg, but voter preference surely correlates with geography (and other factors?). Ogg will face a rematch against Devon Anderson in the fall. 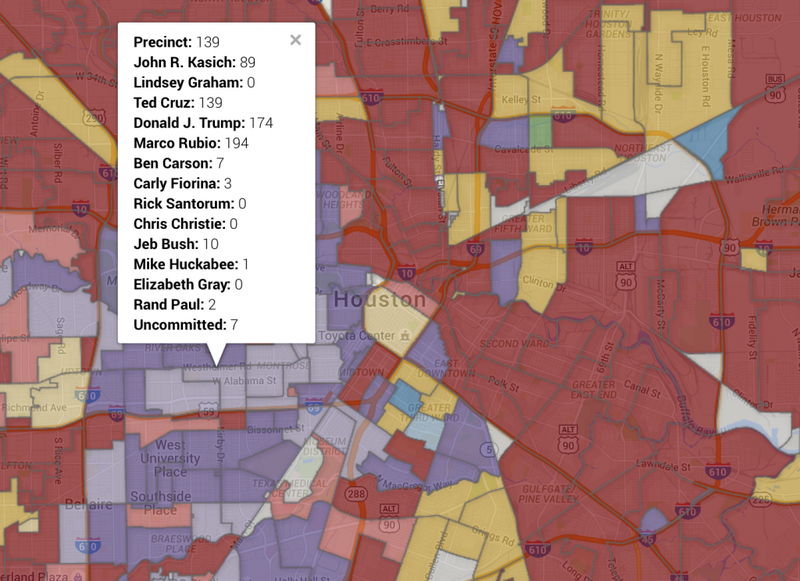 This map from Mike Bader looks at the racial composition of Houston’s neighborhoods from 1970-2010. As Houston continues to diversify, the effects of gentrification aren’t as pronounced as cities like Los Angeles., due in part to historically stable Black communities. This is good for neighborhood protection, but could lead to long-term segregation as neighborhoods develop and diversify.